More than 2,300 Bible passages address money. How does your church want to talk about and live out biblical-based financial stewardship? Find resources to inspire, teach and encourage your attenders. How do you want to move ahead with your financial stewardship ministry at your congregation? 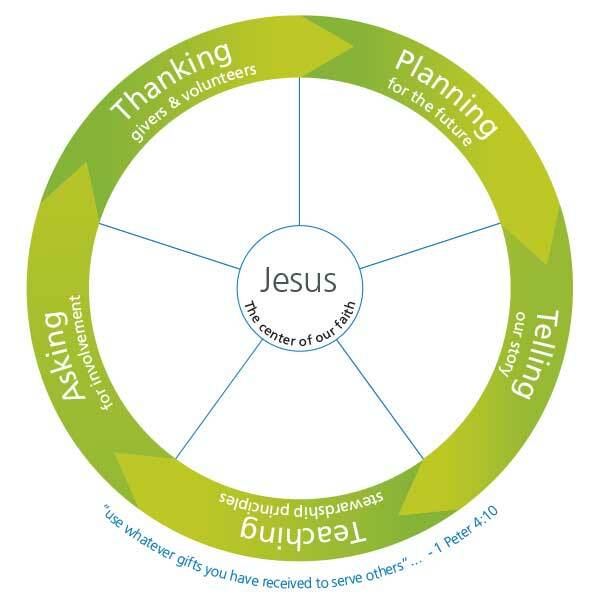 The Stewardship Ministry Wheel is one way to help congregations think about the holistic view of their financial stewardship ministries. Our stewardship consultants work with your leaders to move ahead on your stewardship ministry, and can bring in Everence financial advisors who understand the unique challenges that faith communities face. Worship resources are one of the most popular requests from pastors. You can download these resources (all PDFs) to broaden and enrich your stewardship preaching and worship services. Look at Luke 7:36-50. This passage contrasts a Pharisee and a woman, focusing on their displays of gratitude and generosity. It ties together forgiveness, grace, love, gratitude and generosity in a powerful way, through the actions of a sinful woman, the response of a Pharisee and one of Jesus’ captivating stories about a benevolent moneylender. Share this stewardship story in your church, using the overview below that includes sermon and worship ideas for this special Sunday. Two coins were dropped in the offering thousands of years ago. Today this small gift continues to deeply challenge our generosity practices today. Tell the widow's story in your congregation, using these Stewardship Sunday worship resources. The overview that includes sermon and worship ideas, along with the bulletin insert and PowerPoint slide on this special Sunday. Everence can partner with pastors and lay leaders to map out a stewardship plan for a congregation that supports its vision and ministries. Stewardship education: To support this planning effort, Everence offers a range of workshops, webinars and educational events to inspire and train pastors and lay leaders. Plus, we create and vet many resources for individual and group use. Congregational services: Everence connects and supports churches in many ways, supporting with financial resources, charitable giving assistance and more. Congregational Stewardship Resource Manual: A source of ways to organize your stewardship ministry team, church budgeting aids, sample church finance policies and more. Pastor and staff benefits plus trusted financial advisors: Everence administers employee benefits specifically for churches. We also have advisors to support your financial wellness journey. Learn about our financial planning grant for pastors. Do you want good stewardship education opportunities for your attenders? And maybe you want to help them put stewardship into action? Everence offers a full range of financial and stewardship resources, including books and events. We also offer faith-oriented financial services to individuals. Christian stewardship encompasses all we are and all we have. This theology of holistic stewardship, of aligning our lives with God’s purposes, is embraced by Everence. At the same time, our work focuses on helping churches, individuals and organizations practice stewardship of financial resources.